Per person fares are 8,190 Euros (~$9,665) in a 4 to 6 person cabin and 8,950 Euros (~$10,562) per person in a two person cabin. Fares include all meals and soft drinks. Landing fee is approximately 196 Euros (~$231). SAIL TO THE MOST REMOTE PLACES IN THE WORLD! Your Antarctica expeditions are voyages for the sailing and bird lovers, for photographers, artists or just nature admirers. This expeditions to Antarctica starts in Montevideo (Uruguay), with a stop at the remote island of South Georgia (U.K.) with its unique ecosystems filled with birds and sea animals. From here we will continue south, on the way albatrosses and storm birds will accompany the ship to the Antarctic paradise. 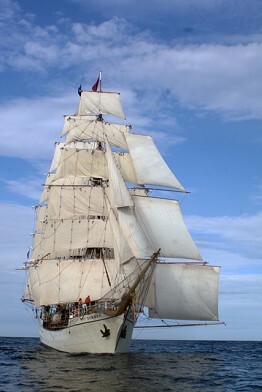 South Georgia and Antarctica expedition: EUROPA uses the traditional sail routes of the tea clippers where favorable winds can be expected. Sometimes, when there is no wind the engines will help to reach the scheduled harbors on time. The voyages from the northern to the Southern hemisphere are no luxuriously sailing cruises. All aspects of a sailor’s life will be experienced. Because many sailors will be on board for a long time there is not much difference between the standard crew and the other sailors. Most people on board wish to join the watches. Everyone is welcome to take the helm, setting sails, and much more. During these voyages, also because of the good weather, there can be a lot of maintenance done to the ship. 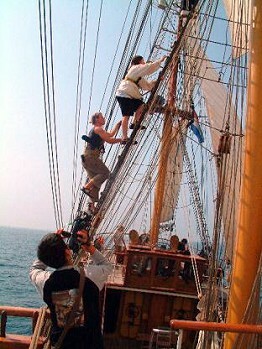 Working in the rigging, sanding, painting, etc. Everyone can participate; anything you may, nothing is enforced! Montevideo is the largest city, the capital, and the chief port of Uruguay. The settlement was established in 1726 by Bruno Mauricio de Zabala, as a strategic move amidst a Spanish-Portuguese dispute over the platine region, and as a counter to the Portuguese colony at Colonia del Sacramento. Montevideo has a population of approximately 1,325,000 (about half of Uruguay's population). The southernmost cosmopolitan capital city in the Americas and third most southern in the world, it is situated in the southern coast of the country, on the northeastern bank of the Río de la Plata "Silver River" which is often referred to in English-speaking countries as the River Plate. According to some sources, in 2007 Montevideo provided the highest quality of life in Latin America. Described as a vibrant, eclectic place with a rich cultural life, it is the hub of commerce and higher education in Uruguay. The architecture of Montevideo reflects its history, ranging from colonial to Art Deco, and influenced by Spanish, Portuguese, Italian, French and British immigrants. As a sub-Antarctic island, not many people have ever set foot on South Georgia Island. Only ships and yachts can take you there, as there is no airfield. It is one of the most remote and beautiful spots on the planet, with mountains standing some 7,000 feet from the ocean, and awesome glaciers, as well as beaches and low grassy areas on the shore. Wildlife is everywhere in abundance. South Georgia hosts millions of fur seals and elephant seals, and even more penguins, both King & Macaroni penguins. You will also see colonies of Albatross, who come to the island for breeding, but spend most of their life at sea. You will encounter the spectacular Antarctic Peninsula and the surrounding islands and protective coves and waterways. Glide around enormous tabular icebergs by Zodiac, walk along beaches covered with thousands of penguins, and kayak amid abundant marine life. Ushuaia in Tierra del Fuego, Argentina, is the southernmost city in the world, and the principal gateway to Antarctica. The city is surrounded by coastal forests and by mountains of the Andes. Directly on the Beagle Channel (named after Darwin's expedition ship), Ushuaia is about 600 miles across the Drake Channel from the Antarctic peninsula.